A dark and dingy corridor in a crumbling, remote Romanian abbey ends at a creaking wooden door that has the following words scrawled on it: God ends here. 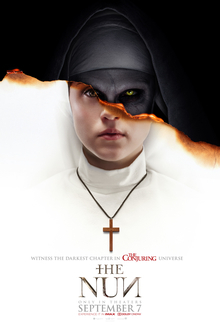 That’s about as good as it gets in Corin Hardy’s spinoff of The Conjuring series that serves as a partial prequel to the second. We learn that in the dark ages, a Romanian aristocrat with a penchant for all things Satanic summoned a creature of the dark lord called Valek through a portal that opened up in the abbey’s foundations. Sterling work by the Pope’s troops managed to kill the lord and close the portal (that is sealed by an artifact that contains the blood of JC), but then Nazi bombs during World War 2 stir up all the old nastiness. It’s this kind of rubbish that scriptwriter Gary Dauberman expects us to swallow as the writer-director team take us through an A-Z of horror movie clichés. The plot features “miracle hunter” Father Burke (Demian Bichir) who is sent by the Vatican to investigate the seeming suicide of a nun at the abbey in 1952. The good Father teams up with Catholic novitiate Sister Irene (Taissa Farmiga) who is chosen for the authenticity of her “visions”. The pair are assisted by local yokel “Frenchie” (Jonas Bloquet) who contributes some much-needed humour and secular common sense to the enterprise. Clearly, the movie makers have a lot to do to convince the sceptical minds of 21st Century audiences to suspend their disbelief. They fail dismally, largely because of an incoherent narrative that fails to sustain the increasingly frenetic demonic action. The jolting sound effects that erupt out of a background of swirling deep bass organ notes signal a variety of flesh-creeping events that quickly lose their shock value. There are, admittedly, a couple of stand-out moments, but they are lost in a sea of dross. In the main this movie is an increasingly absurd “boo-machine” which, at 96 minutes, long outlasts its welcome. I’m still partial to a really good horror movie, and Jamie Lee Curtis’s imminent return to the Halloween franchise (only John Carpenter’s initial film has, so far, been worth seeing) is enough to whet even my jaded appetite for the genre. But, sadly, The Nun is a no-no.